Spice up your look by dyeing your hair with bright pops of color! Come check out the different ways you can wear this trend! The rainbow hair color trend has been around for while now, but it hasn’t really lost its appeal. How could it? The combination of fun, vibrant shades all on one head will always add an irresistible charm to any look. If you’ve been wanting to do a major hair makeover but your vibe leans towards the cutesy than edgy, the rainbow hair color could be it for you. To achieve this Rainbow Brite look, you either have to bleach your hair (we’re assuming you’re a brunette like the rest of us, but if you’re already blonde, congrats—you’ve got half the work done! ), or go for subtler shades that would only require for your tresses to turn a light shade of brown. Now to make this colorful style even more interesting, you can add a fun twist to the look. Need ideas? Look no further ’cause we’ve got some for you! Keep scrolling and check out the cool ways you can wear this trend below! Wearing your rainbow hair ombre style is one way to keep it stylish but a bit subtle (compared to dyeing all of your hair!) If you have long locks, the colors can start at mid-length with maybe a few strands on the sides going up a little higher. This also allows you to sport this look much longer than if you have a full head of rainbow hair, because even if your hair grows, it wouldn’t show awkwardly dark roots. Editor’s tip: Don’t forget to give your hair a bit of extra attention after getting this dye job done on your hair. 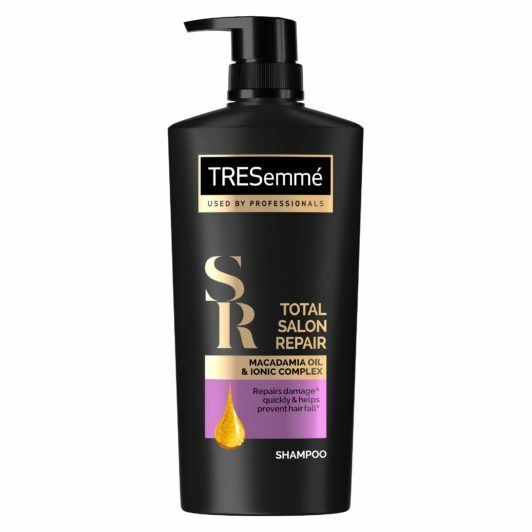 Bleaching and coloring causes a lot of damage to your locks, so bring it back to health by washing it with TRESemmé Platimum Strength Shampoo. This product repairs up to two years’ worth of damage in just five uses by helping reinforce your hair’s natural protective barrier, restoring hair, and making it stronger, more resilient to future damage. Surprise! 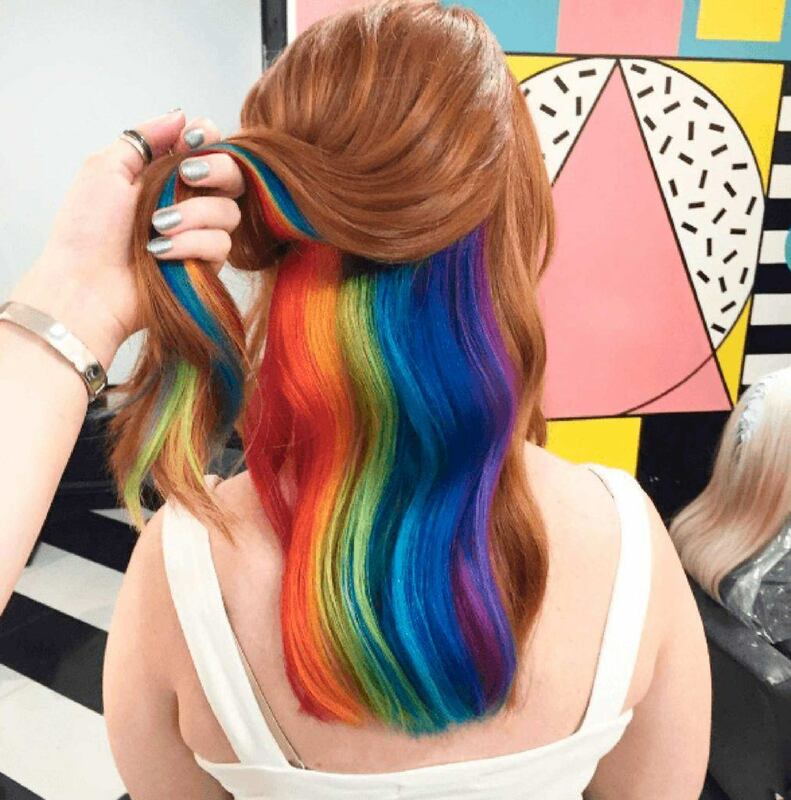 A rainbow party happening somewhere in the middle section of your hair! Not only is this version of the trend so much fun (it’s like keeping an exciting secret! ), it’s also very clever. If your workplace has a very corporate setting, donning multi-colored hair may not sit well with HR. But this, this will let you express yourself without having to get a memo—just leave your hair down in the office and half-up it as soon as you’re out the door. It’s also cute to have just a part of it peeking out of your bun hairstyle. 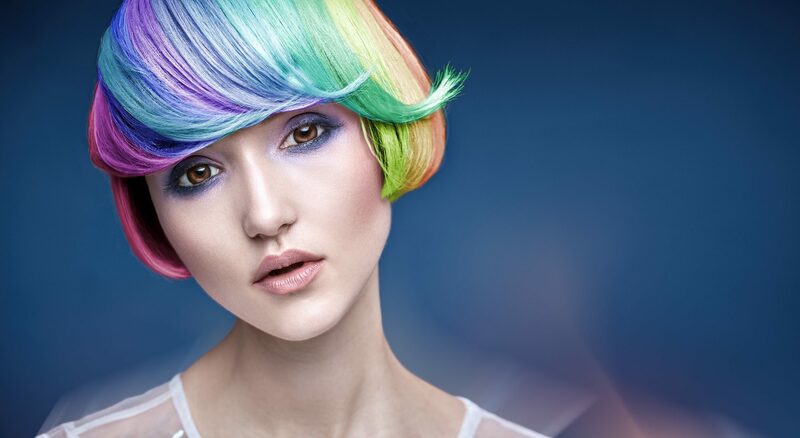 Editor’s tip: Rainbow hair color may fade faster than, say browns, so use products that are specifically formulated for colored hair, like Cream Silk Color Protect Conditioner, to keep it vibrant. Is rainbow hair color not cool enough for you? You’re already stepping out of the box with your hairstyle, might as well do it way cooler—and sparklier–than everybody else, right? This version is actually less complicated to achieve, no bleaching required. Just mix some styling gel and colored glitter into a bowl, get an old paint brush, and apply it on your hair. If you think that you need long hair to be sporting a cool rainbow hair color, then this should be your proof. Even a haircut like a bob can fashionably pull off the vibrant colors of the rainbow. It sure is a nice futuristic look that would be great for costume parties or cosplay conventions. 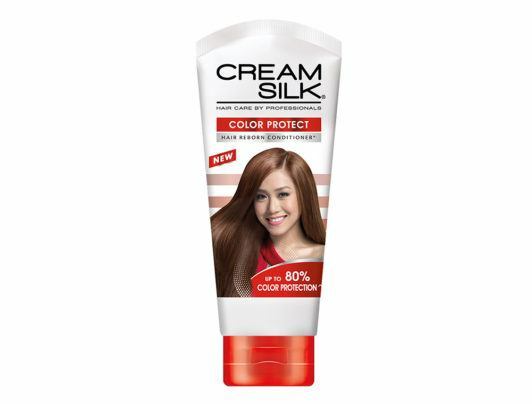 Editor’s tip: Your hair needs to recover from the damage done to it during the coloring process. Restore lost moisture from your hair by using TONI&GUY Damage Repair Mask. There are many types of braids that can be easily done for a quick style. Imagine adding the colors of the rainbow to those funky braid patterns. 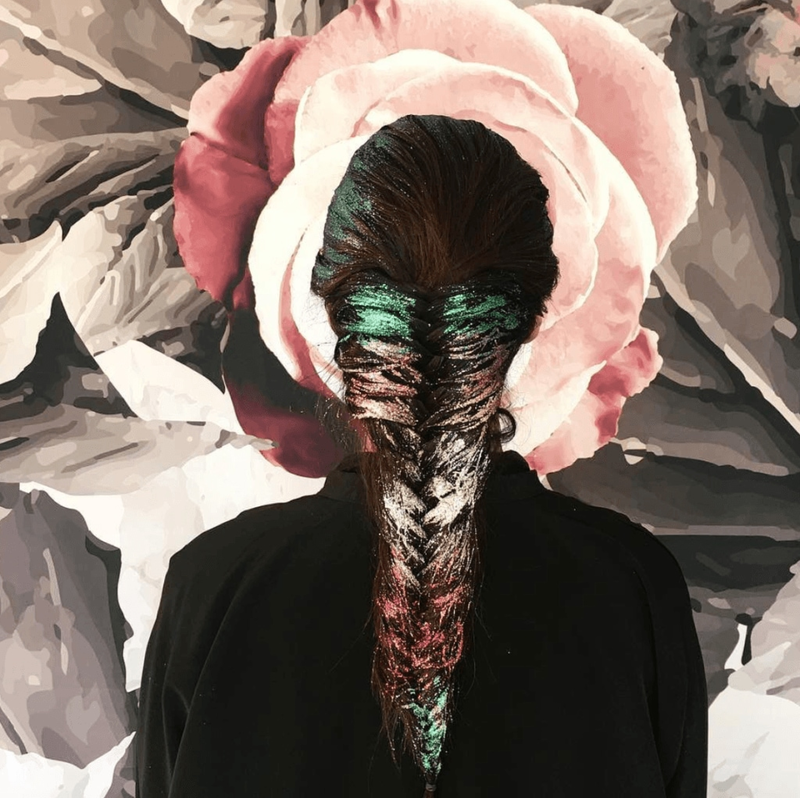 Achieve a clean and sleek but colorful boxer braid or channel your inner Khaleesi for a rainbow dragon queen braid. There are so many options, just check out Braids section. 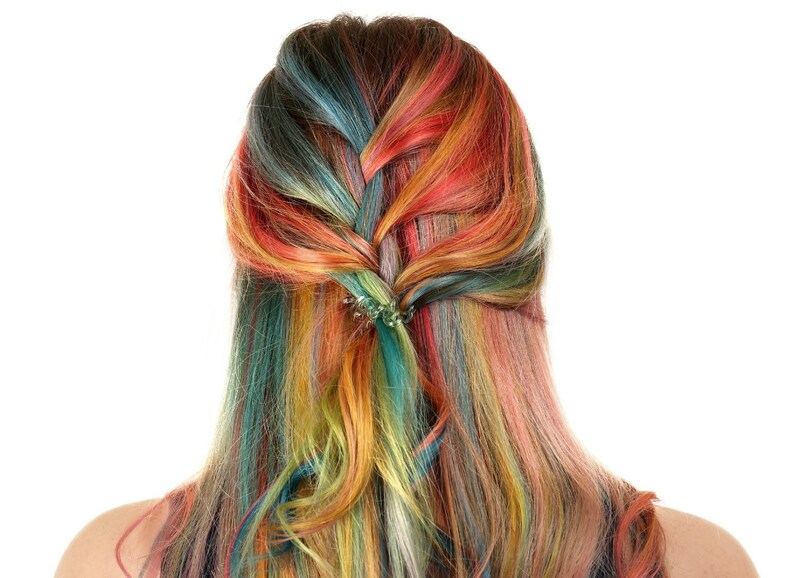 Like hair braids, knots are fun hairstyles you can try with a rainbow hair color ‘do. There’s a lot to choose from, depending on the occasion or your mood. There are hair knot styles that you can wear for formal occasions, others are very comfortable for casual wear and others are very fun and playful. Check out our video tutorial on how to do a topknot with upside down braid. Editor’s tip: bleached and colored hair is stripped of hair nutrients that cause dry, frizzy and dull hair due to damage. 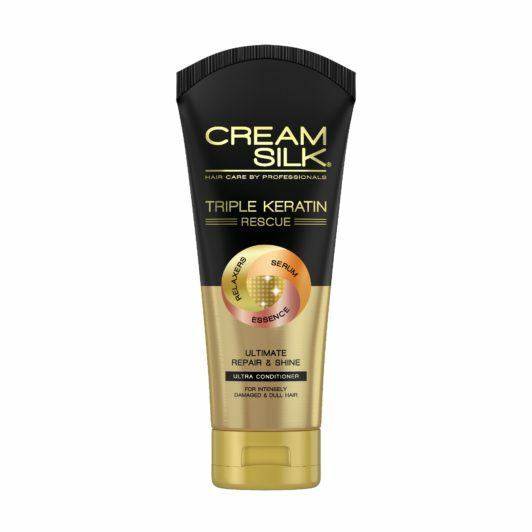 Restore hair’s vibrancy and health by using Cream Silk Triple Keratin Rescue Ultimate Repair & Shine, comparable to having a salon keratin treatment at the speed and convenience of a conditioner. 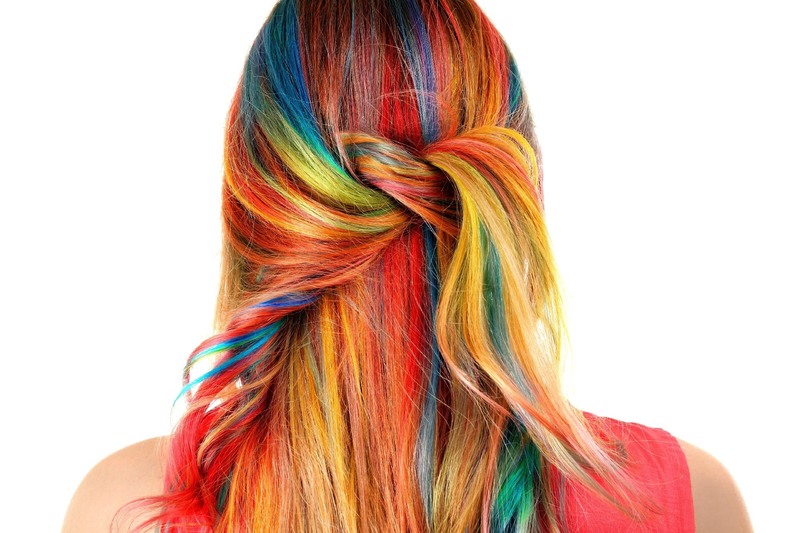 If you’re game for an outrageously fab look, you should def give the rainbow hair color trend a try! Oh, and did we mention the magic words? It’s definitely Instagram-worthy material! Next read: Don’t you just love how playful a rainbow hair color can be? If you want to try another adventurous hair color, ultraviolet is a good bet.